Google Earth added a very interesting layer that shows news from the New York Times that mention a certain place. Search for an address and you should see some small New York Times logos that hide previews from recent news articles. Google LatLong Blog mentions that the layer is updated every 15 minutes, so it's probably the most up-to-date layer from Google Earth. 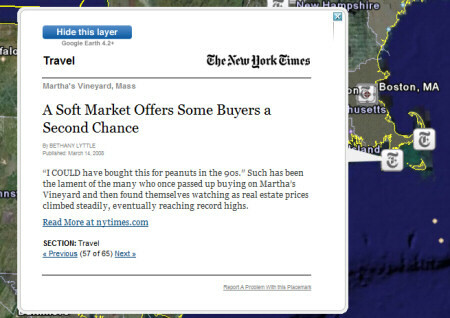 "The New York Times offers geo-coded news, and Google Earth offers the platform for reading that news in a 3D browser. This is the first time we've endeavored to show news updated in real time, and we're very excited to work with this first-class publication to bring you the latest and greatest news." It would be a great idea to port this layer to Google Maps and show the latest news from every place of the world. I think they got this idea from the Wii! It's built-in news map does the same thing. And just like the Wii, it seems like a silly waste of time. The results just don't seem interesting or useful. I don't want to say that browsing news geographically via a map is a completely useless idea (even though it might be), but just showing me every NYT article that just mentions that particular place is not going to be useful. Lots of it will be uninteresting news. @Ron Michael - They sure did take this one from the Nintendo Wii playbook. While I agree in the sense that this is a largely ineffective way to browse the news, it still is interesting to see where news is breaking at a glance. Wonder if the news icons will stack in a location, as it does on the Wii. Makes it even more interesting to see where the most news is being generated. Just like Sid Meier's Civilization. It would be nice if google guys add a feature to build cities and unites. Of course, the NYT has much of the news focussed on New York, a few more around the US but very little around the world. Does this imply that the NYT does not focus on world issues? They didnt take it from the Wii. I was at their headquarters for a visit already in the summer of 2005, and some people were talking about this feature back then.